And here, at long last, is the ridiculously late Part 2 of my favourite films of 2010. Arriving just in time for the Oscars, no less! (Having seen only 4 of the Best Picture nominees – two of those in 2011 – I’m not going to be judging my choices against the Academy’s decisision, but thought it was a nice coincidence.) Anyway, on with the show. Edgar Wright was one of my favourite people in pop culture during the 2000s, first creating the wonderful and witty Spaced, then expanding his TV success onto the big screen with Shaun of the Dead and Hot Fuzz. Now he’s staked a claim to the same level of achievement during the 2010s, adapting Bryan Lee O’Malley comic-book series about a lovelorn slacker battling his way through seven evil exes to win the girl of his dreams. It’s a ridiculously fast-paced movie, cramming in visual gags and little asides every chance it gets. This is what I enjoy about Wright’s movies: he loves the audience, and he has enough respect for them that he trusts them to catch all the details. His films are made for watching again and again, and the amount of care he puts into them is obvious. 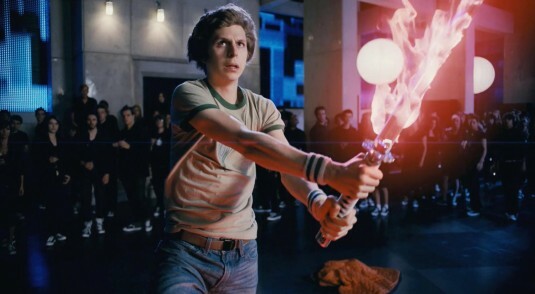 I’m an unapologetic Michael Cera fan, and he offers up some interesting variations on his usual “sensitive nerd” persona, bringing the more unpleasant aspects of Pilgrim’s personality to the fore without having the audience lose sympathy for him. Able support from Mary Elizabeth Winstead, Alison Pill, Ellen Wong, Anna Kendrick, Aubrey Plaza, Chris Evans, Mae Whitman, Jason Schwartzman, and a hilarious turn from Keiran Culkin as Scott’s roommate help to round out the cast. While Scott Pilgrim may not have set the box office alight, its obvious enthusiasm and dedication to entertainment shines through in every whip-fast bit of comic banter and deliriously flashy action set-piece. It’s a film for a generation raised on indie music and video games, who still need to learn how to love. Standout scene: The battle of the bands competition – and the first fight. Ramona Flowers: You have a band? Scott Pilgrim: Yeah, we’re terrible. Please come. Let’s talk about likeability. To what extent must the audience like and admire a character to be able to identify with him? Well, obviously the anti-hero tradition has been established in fiction for a long time, but those guys usually have plenty of charisma to keep us on-side. What’s braver: playing a cocky, swaggering rogue, or a complete douchebag? Having given us an uncomfortably close view of family breakdown in The Squid and The Whale, Baumbach concerns himself in Greenberg with a curmudgeon’s efforts to throw away the comfort blanket of glib, self-absorbed cynicism and just grow up. 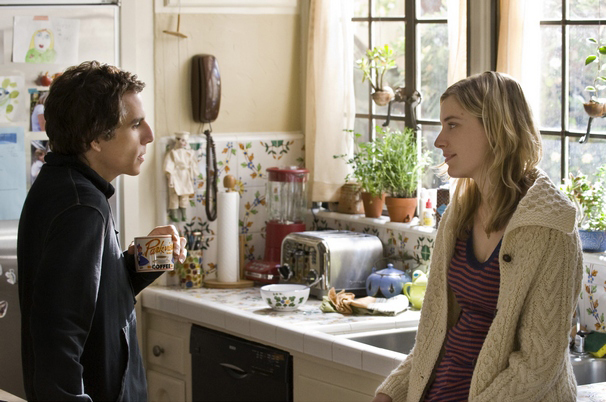 Ben Stiller gives a surprisingly restrained and adept performance as Roger Greenberg, a grouchy NYC resident who flies out to LA to house-sit for his wealthier brother and forms an awkward sort-of relationship with Florence Marr (Greta Gerwig), the family’s live-in help. There are some hilariously uncomfortable moments as Greenberg’s self-absorption and unpleasantness test our empathy with him to the extreme, even as Gerwig’s performance as a sensitive but directionless twentysomething engages our sympathies. This is a story of two people who are damaged in their own ways, trying to make something better out of a world they can’t quite figure out. While the antisocial-male-meets-gorgeous-and-understanding-female film is a genre that’s way too overexposed, Greenberg gives it an emotional dimension that belies the scornful nature of its protagonist. Standout scene: Greenberg’s birthday party. Ivan: Youth is wasted on the young. Florence: [to Greenberg] You like me so much better than you think you do. In a summer season that was generally a pale imitation of last year, Christopher Nolan’s mind-bending sci-fi/heist/psychological thriller stood head and shoulders above the competition. As a team of operatives in a dystopian future break into their target’s subconscious, they remain unaware that the crippling psychological baggage carried by one of them threatens the entire mission. The great thing about Nolan’s intricate puzzle of a script is that while it literalises an internal conflict by presenting it as a daring mission to plant an idea in the target’s mind, the traditional hero’s-journey arc that is so often shoved to the forefront in much mediocre Hollywood product is here subtly buried within the narrative. The characters’ background informs their actions, but how much of said backstory we can trust remains a mystery. Nolan’s action chops have also been steadily improving from film to film, and here he confidentially stages a series of thrilling set pieces that get the adrenaline flowing as the rest of the film exercises the mind. Standout scene: You know what it’s going to be: the famous rotating corridor fight scene. Once you know how it was done, it becomes even more astounding. Cobb: An idea can grow to define us, or destroy us. The standout film of this year’s Cambridge Film Festival, Debra Granik’s mix of crime drama, modern-day Western and examination of rural desperation packs a devastating emotional punch, pitting an innocent yet steely teenage girl against the malevolent forces preying on her community. Newcomer Jennifer Lawrence delivers an outstanding performance as Ree Dolly, full-time carer for her younger siblings and disabled mother. When the local sheriff announces that her criminal father has skipped his court appearance after putting their house up for his bond, Ree sets off to find him before the house is forfeited. Granik expertly conjures an air of menace from the bitterly cold, devastated landscape of the Ozarks, punctuated by lonely farmhouses and burnt-out meth labs. There is excellent support from John Hawkes as Ree’s tortured and terrifying uncle Teardrop, Garrett Dillahunt as the sheriff, and Dale Dickey as the matriarch of the local meth ring. 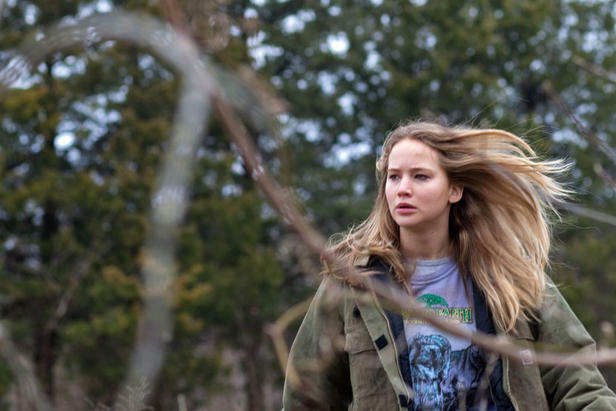 Winter’s Bone is a feminist text, simply by dint of filming a traditionally masculine adventure story with a female protagonist, but builds the audience’s admiration for her without stacking the deck. Ree is brave, resourceful and determined simply because she has had to be to live in this situation and provide for her family. There’s a startling clarity throughout the film; of form, performance, visuals and story, informed by the sheer toughness of life in that location. It’s a singular and gripping film that tells a great story of nobility in the face of deprivation. Standout scene: The confrontation between Teardop (Hawkes) and Sheriff Baskin (Dillahunt). Jacques Audiard’s crime drama made a few people’s best of 2009 lists, but only came to my local art cinema early last year. No matter; I’m giving it its dues right now. Following the progress of Arab teenager Malik (Tahar Rahim) from clueless newcomer to a brutal French prison into a ruthless criminal boss, Audiard thrusts us into a nightmarish world where violence and power rule. Yet beyond the Scorcese-ish flourishes of explicit violence, Audiard finds room to examine the immigrant immigrant experience in French society. In prison, Malik is caught between his fellow Arabs and the ruling gang of Corsican separatists, led by the terrifying Cesar (Niels Arestrup) – neither group is accepted within the outside world, and Malik feels at home with neither. Yet, armed with nothing but a certain low cunning, he manages to claw out a position for himself within this world, and to flourish within it. Audiard tells this epic story without casting judgement on the protagonist, but without endorsing his crimes either. Malik may be a wide-eyed innocent at the beginning, but he leaves a trail of bodies along his rise to power. Rahim’s face alternates between blank canvas and devastatingly effective portrayal of a young man scarred by every killing he commits. At the same time, Audiard alternates the true-crime grit with a strangely abstract and lyrical visual sensibility, including the on-screen appearance of ghosts of the dead and a visual motif of deer running through the woods. It elevates the film to something more than just an exceptional gritty crime drama, but it’s the shocking violence, the well-choreographed action sequences, the witty script and the fine performances from all the central players that make this a truly great film. Standout scene: Malik’s mission to assassinate a fellow inmate using a concealed razor. In the various recent obituaries of Faster, Pussycat! Kill! Kill! star Tura Satana, there was an intriguing detail about how Russ Meyer's films and their stars languished in obscurity for years before being discovered by proponents of "trash culture" or whatever you'd like to call it. For someone my age, who more or less grew up in an irony-saturated era where cult movies had become an accepted canon themselves, thanks to Danny Peary and others, it's a novel sensation to think about a time when films like Faster, Pussycat! were genuinely underground items. I've been critical before of the culture of ironic appreciation which is everywhere these days, but frankly I loved seeing Faster, Pussycat! at the IFC Centre in Manhattan, and having access to these wonderfully odd, off-kilter pieces of art all the time thanks to the magic of the Internet and what Patton Oswalt called "ETEWAF: Everything That Ever Was—Available Forever" (he sees it as a negative – I think it's a positive thing). Plus, ironic enjoyment only becomes an impediment to genuine enjoyment if you take the whole experiencing-and-discussing-culture thing way too seriously – which I definitely do at times. But having grown up in a cultural climate where Quentin Tarantino – that avid consumer of trash culture – is the de facto inspiration for a huge amount of young wannabe filmmakers, John Waters is a cuddly establishment figure and the midnight movie grindhouse experience of community has been turned into something similar yet different by the internet (where people miles apart can watch and livetweet Mega Shark Vs Giant Octopus or something else), it's very odd to consider a time when cult/trash movies were a genuinely underground proposition. And it's also interesting to consider the generation of filmmakers who came of age or broke into the mainstream in the late 90s/early 00s when the Age Of Irony was fully underway, some of whom are dangerously close to becoming elder statesmen themselves, and the relation of our culture-wide sense of irony to their work. As mentioned above, is in Tarantino's lifeblood. He couldn't jettison it from his films even he wanted to. The Coens have an excellent grasp of genre and pastiche, and a quizzical detached style which makes for surreal and addictively intriguing films. That said, they've gained the most mainstream praise when they play it (relatively) straight, as with No Country For Old Men and True Grit. David O Russell has been on a similar trajectory with more disappointing – after I Heart Huckabees' poor box office reception (justified, I think – it's a film that's a little too pleased with its own cleverness) he cycled through a variety of uncemploeted projects before losing the surreality and quirkiness of his early work like Three Kings and making a fairly conventional boxing drama – which, sure enough, found itself Oscar nominated. Wes Anderson ploughs his own furrow, to slightly diminished returns with each new film – I remember when he made films where you actually cared about the characters (Rushmore? Tenenbaums? Anyone?). Steven Soderbergh has alternated between conventional Hollywood films and more off-kilter projects. At the very least, he should be praised for being one of the most entertaining directors of populist entertainment working today, as well as getting some genuinely original stuff made in Hollywood's unforgiving cultural climate. Paul Thomas Anderson has an excellent grasp of irony, but rarely deploys it upfront. It's used to very subtle effect, as with the surreal moments of black comedy in Boogie Nights and There Will Be Blood. Darren Aronofsky is the only major new-ish talent who completely eschews ironic distance in his films (aside from The Wrestler, which comments cleverly on 80s nostalgia while still being a straightforward, heartfelt indie drama). At its best, irony is another tool for understanding, representing and commenting on the modern world and our relationship with it. At its worst, it insulates us from sincerity and real understanding. David Foster Wallace took an umbiguously pessemistic view of the subject in his essay "E Unibus Pluram". I think that just like any artistic device, it can be used in good and bad ways. In the end, our culture has a vastly expanded canon compared to only a few decades ago. And that's something to be sincerely excited about. Given what’s currently going on in Libya, David Rose’s Vanity Fair piece on Tony Blair’s dealings with the Gaddafi regime is essential reading. And on that note … Tony Loves Dictators. Thank you Tumblr. Neal Stephenson on lock-in, path dependency and rockets. 7 Google Chrome Annoyances and How to Fix Them. The New Yorker’s Adam Gopnik looks at the recent trend of books about the Internet’s effect on us. Five Emotions Invented By The Internet.